Bhubaneshwar: AMRI Asian Cancer Institute, AMRI Hospitals, Bhubaneshwar, successfully completed 1 years of the association and the journey continues. On this juncture a unique CME has been conducted at Hotel Mayfair Convention on 22nd July’2017. 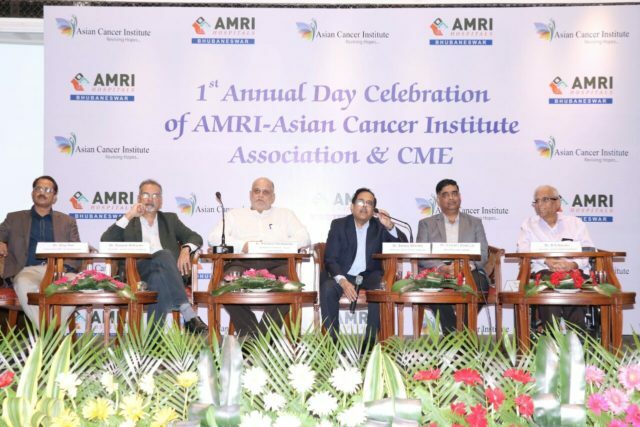 Present on the occasion were renowned Cancer doctor of the Country, Dr. S. H. Advani , Senior Advisor, Asian Cancer Institute(ACI), Dr. Ramakant Deshpande, Executive Chairman & Director, ACI, Dr. Sanjay Sharma & Dr. Deepak Parikh Directors- ACI & Dr. (Lt.Col.) Vivek Lal, VP, Unit Head, AMRI Hospitals, Bhubaneshwar. Over the last one year, AMRI Asian Cancer Institute has been providing latest cancer care services to the people of Odisha. Dr. S. H. Advani , Senior Advisor- ACI, elaborated and discussed about the Chemotherapy and moving forward from Chemotherapy. “Cancer is increasingly becoming a widespread malady. Our understanding of casues, effect and treatment of cancer is increasing rapidly on a global scale. Through this collaborative endeavour, Asian Cancer Institute is trying to reach out its services beyond Mumbai and offer world class treatment in cancer to the whole country.”, said Dr. Advani. The surviving current cancer Population in India is around 45 lakhs, and around 11 lakhs of new cancer patients are getting added every year. While men in India are getting afflicted mostly with cancer of head and neck, lungs and prostate, women are getting largely diagnosed with breast cancer along with ovarian and cervical cancer. AMRI Hospitals, Bhubaneshwar, a Super Speciality tertiary care hospital is a part of the AMRI Hospitals Ltd, which is largest and fastest growing chains of private hospitals in Eastern India.